When you think "mother of the bride," maybe you picture a proud, serene woman, pulling a neatly folded hanky out of her purse to discreetly blot proud tears from her welling eyes. Well, perhaps this is what you see at the final stages of Operation Wedding, but underneath that tasteful-but-not-too-flashy-and-certainly-not-white dress is a guerrilla deal maker/politico who's been to the edge of madness and has the battle scars to prove it. 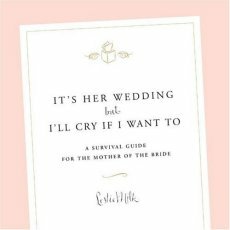 Leslie Milk has been in those shoes (and that dress), and now she's written the ultimate survival guide for other mothers of the bride. Packed with hilarious stories of weddings gone awry and rescued from the point of disaster by quick-thinking moms, this book will prepare you for all the emotional, logistical, and financial challenges of being the second most important woman of the big day.